Community is a really fun show because it’s about adults having the chance to act like kids, and by extension, giving the audience that chance as well. I discovered this show very recently (Abed totally would have won a spot on my precious TV characters list). It may not be considered high brow but it’s got charm and heart (and a lot of Arrested Development cast and crew). This is an ever changing list and I’m sure you’ve figured out by now that when I say top 10 I mean my favorite 10, but right now, my list would look some thing like this. I loved the entire storyline of Annie rooming with Troy and Abed and this is where it all began. Also, the way Annie becomes angry with Troy and Abed so quickly and how they make it up it up to her is handled wonderfully and adorably. The token musical episode, but very funny. Deserves a shout out for Troy and Abed’s Baby Boomer Santa number and Jeff’s facial expression after he joins the dark side and agrees to join the glee club show. Plus a sweet schmaltzy ending. Considering that almost the entire episode is the group sitting around the table, the episode is very engaging. Good directing, sound effects, and editing. Of course, it’s fun to see these detached grown-ups get so into their roles. It’s one of their theme episodes, but for anyone who grew up on 8-bit Mario brothers games like me, there’s a certain sentimental effect that makes this episode really stick. That’s true of a lot of the themed episodes I’m sure, but personally, this one stood out to me. The things that happen in the game are surprisingly inappropriate, but because they’re so unexpected, they’re actually very funny. Seeing as it’s a video game, the group all fares about as well as you’d expect, with Pierce being the absolute worst, barely making it out of the first room, and Abed being the best, practically creating an entirely new game within the game. Meanwhile Shirley and Annie’s commentary on the morals of the game, as they murder virtual innkeepers and burn down virtual buildings, is priceless. It’s also the introduction to Gilbert, Pierce’s illegitimate half-brother (played by Giancarlo Esposito, the best bad guy from Breaking Bad). The relationship the group develops with him over the course of the episode is actually very cool, and there’s a sense of closure for both Pierce and Gilbert, who have been grappling with their father’s death. Grab your tissues, everyone. Season 5 packed a one-two punch, first by killing off Pierce, which then resulted in shipping off Troy. Abed, awful with good-byes, organizes a school-wide game of the-floor-is-lava. A fine game, which I still play on occasion and played a TON as a kid. 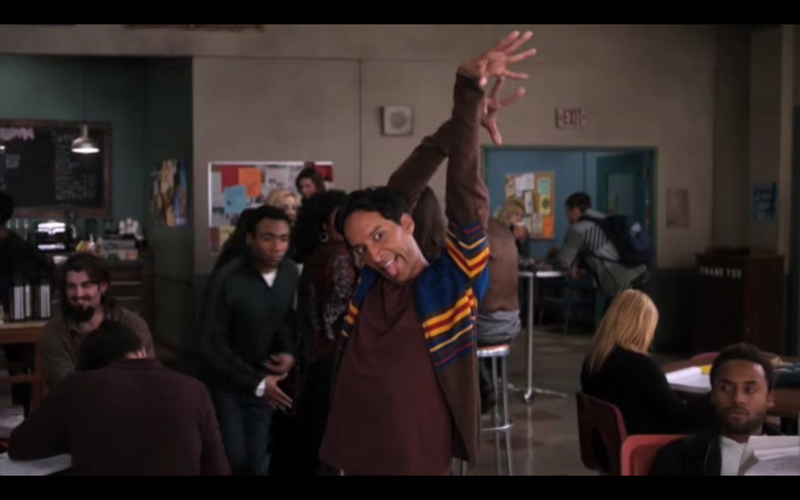 But at the end of the episode, Abed admits that he actually sees the floor as being lava (his character has more psychological breaks than entire casts of other shows). Britta, who had spent the entire episode trying to make Abed talk out his problems, realizes that, for Abed, this is managing his problems and will do him better than talking it out would. She eventually gives in and embraces the game as much as Troy and Abed. Abed copes when he and Troy both fake die in the game so they’ll remain together at Greendale and then claim they’ve made clones of themselves (with Britta’s help) and it’s clone-Troy that’s leaving. Abed notes that he mixed homing pigeon DNA in Troy’s clone so he may feel the compulsion to come back. *sniff* And then Troy gets on the boat with LeVar Burton to sail around the world while Come Sail Away (a song Troy admits in an earlier episode makes him cry) plays him out. This is the first glimpse we get of a Jeff/Annie relationship, and while it’s not an ideal ship for me, it was the first time the show had explored pairing Jeff with…not-Britta. And it’s adorable. The cool, calm, collected Jeff is so shocked at his sudden crush that he turns into a a babbling mess around Annie. But before that, when when he first enters the debate, which is whether man is good or man is evil, Jeff tries to attorney his way through it and the judges give him a thorough and satisfying smackdown. It’s always delightful to see Jeff put in his place. And then something amazing happens. Jeff actually puts an effort in and does a fantastic job. That’s really when Jeff starts noticing Annie. There’s actually proper character growth around the debate because it’s the longest that Jeff has focused his attention on something other than himself. He and Annie are actually gonna win, until the competition vaults out of his wheelchair and Jeff catches him. Annie’s rebuttal is to kiss Jeff, who is so shocked he drops the competitor. The win goes to Greendale. Yes. The entire episode is about a lost pen. This is possibly the best showcase of each of the characters personalities. I saw the first half of this episode awhile ago, before I started watching the show, and each of the characters were crystal clear even to someone (me) who didn’t know them. 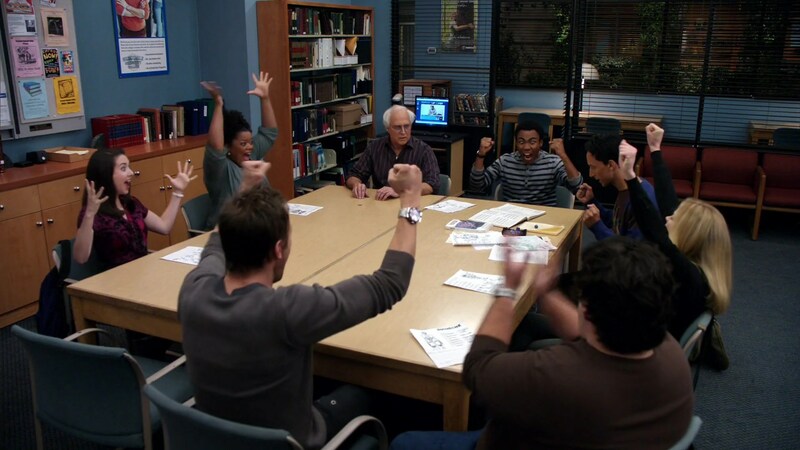 If you’re trying to introduce someone to Community…well, start at the beginning, but if for some reason you don’t, this episode works nicely as an entry point. The reason it works is that it’s so simple. Annie’s pen gets stolen and each of the other characters hurry to prove that they aren’t the thief. Their reasoning and excuses all paint clear portraits of the characters. They all start accusing each other and a lot of their issues get aired out. A really impressive element of this episode is that it takes place entirely in real time, with the exception of two time jumps (to get the characters undressed, then redressed). It’s also fun to see Jeff loose his mind and start destroying the library. Also, there’s an adorable puppy cameo and Troy’s equally adorable theory that a ghost took the pen. This episode is so high on the list because of personal experience. Troy and Abed are massive fans of the show Inspector Spacetime, a loving parody of Doctor Who, a show for which I annually attend a convention. So the episode has a very familiar feel. The look of wonder and awe that Troy and Abed have upon arrival, and the looks of confusion and eye-rolling from the other characters was also, unfortunately, very real. It also addresses the fear all Doctor Who fans have, that a network will attempt to create an American version of the show (the segment they show at the end of the episode is horrendously spot on). The episode is really about Troy and Abed’s friendship being ripped apart, which is actually rooted in Abed’s fear that Troy would rather spend time with Britta, who’s his girlfriend at this point. The relationship is repaired with some nudging from Britta. Other fun elements: Britta’s fixation with the awful, but only female Inspector, Jeff’s ridiculous British accent, which is followed by two different characters throwing their drinks in his face, and guest stars Matt Lucas, Tricia Helfer, and Luke Perry. This one I like because it’s clever, but also heartbreaking at points. Plus lots of Inspector Spacetime. Annie fixes up Britta and Troy, which means Abed and Troy don’t see as much of each other and Abed is not happy. Annie offers to join him in the Dreamatorium (a special room in the apartment which is essentially a designated area for playing make-beleive). Most of the episode is Annie and Abed acting out scenarios as the other characters, which is how the rest of the cast is worked in (we see what Annie and Abed imagine when in the Dreamatorium). The episode is important as it works out a lot of Annie and Abed’s problems. Abed accuses Annie of being in love with Jeff and claims that her not knowing how to handle her own relationship is the reason she’s meddling with Troy and Britta’s. But Annie finally explodes, professing (and maybe only just realizing herself) that she’s not in love with Jeff anymore, just the idea of being loved. Her outburst at the midpoint is mirrored in reverse when Abed admits that the reason he doesn’t want Troy with Britta is he thinks Troy is the only one not sick of him. And he thinks they’ll all stuff him in a metaphorical locker like was literally done to him when he was younger. Shocked, Annie assures him that Troy’s not the only one in the group who cares about him. Then they play Inspector Spacetime and have lunch. I’ll be honest, this episode stirred some Annie/Abed shipping feelings. Well, it’s the introduction to everyone and it really lays the groundwork. From the first scene where the dean gives his opening speech you get a real pulse on the show. Generally pilot episodes are an unfiltered or less filtered version of the vision of the creator and it gets twisted slightly when the show gets picked up. The pilot to Community feels very pure. The show gets dark, it has homophobic remarks, racial slurs, ageist comments, and put downs on the mentally disabled. The pilot pretty solidly hits all of these points, but gets away with it, as the show always does, because the characters who make them are the ones who are ignorant or near-sighted and generally make fools of themselves in the process. Still, it was a brave move and reminded me of Arrested Development in the way that the creator was saying “yes, they’re saying awful things, but they’re idiots, so it’s okay. It’s solid throughout, but the moment when I knew I loved the show was when they’re all arguing and Abed brings them all to a standstill by doing the Bender monologue from The Breakfast Club. And when they ended with the cover of Don’t You Forget About Me, I was very slightly emotional. It’s a John Hughes thing. From the perspective of the film spoofs, this is arguable the best. Taking the Good, the Bad, and the Ugly and allowing Greendale to break out into it’s second school-wide paintball fight was a mad idea with excellent execution. It’s part of a two parter and while both are great (the second part is modeled after Star Wars for God’s sake! I LOVE Star Wars! ), the first half was the more focused and clearly themed of the episodes. Paintball had already been covered. That was their big show-stopping episode from the first season. And it was so much fun they decided, hey let’s just do it again (twice). While the first time around the weapons and style was contemporary, when they got to the second season, they put a fresh twist on the idea by making it a western. The credit’s sequence is maybe the best (and they’ve changed it up a lot), the costumes and the set make the episode really fun. 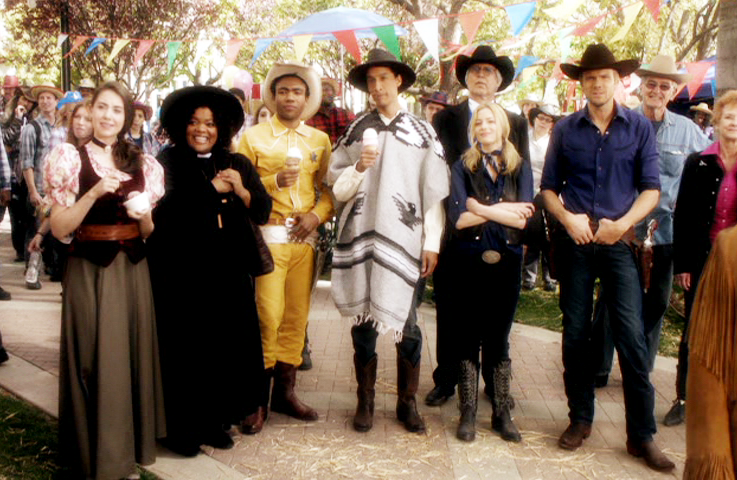 Annie stands out in this episode, becoming a total badass. The code names (of their cards) are clever, if a little painful when you find out what they mean to Pierce. He has a great moment regarding that in the following episode, but that’s for another post. Guest star alert: Josh Holloway! AKA Sawyer from Lost. One of the amazing things about this episode it that it’s (the only one) directed by Richard Ayoade, one of my favorite people. The reason this is is so great requires a little background information: Ayoade played Moss on The IT Crowd, the British sitcom about an out-of-touch IT department. After it’s success in the UK, an American network did that thing that I hate, where they remake the show, from essentially he same pilot script and just cast American actors. Now Chris O’Dowd (you know, the cop from Bridesmaids) plays Roy in the UK’s version and in the American version the role was played by Joel McHale. Ayoade’s role went to…Ayoade. THAT’S RIGHT, THE ONLY ACTOR THAT COULD PLAY THAT ROLE WAS RICHARD AYOADE. Luckily, the American version never got picked up (it’s on the internet though if you want to see it. I’m not suggesting it, but if you so choose…), so I don’t have to hate Joel McHale. And apparently neither did Ayoade, as he directed this episode. So obviously the directing is great, but that aside, we see Troy worried he’s losing Abed (this was refreshing because it’s almost always the other way around), Jeff opening up to Abed and revealing all his most personal moments, and a mini montage at the end in which all the characters play their Pulp Fiction roles. The scene in the above picture is the reason this episode is my favorite. 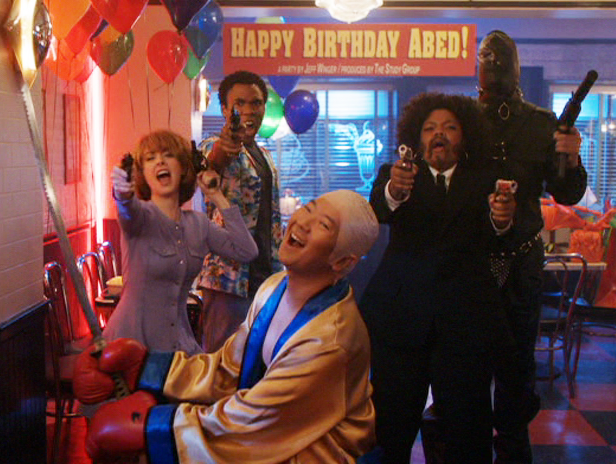 The B storyline in this episode comes about when Troy finds a drawing of who the group assume to be Abed in his textbook. They seek out the previous owner of the book, so that Abed can approach her, but the only way he’s comfortable approaching her is if he acts like a vampire. He also adopts the personas of Don Draper and Jeff at different points during the episode. They go through all this preparation to discover that the girl was actually drawing her boyfriend, a dead ringer for Abed, only white: White Abed (also played by Danny Pudi). The A story’s fun as well. Jeff signs up for a billiards class, but in order to take any of the classes in the gym, it’s required that students wear the gym uniforms, which include very skimpy shorts, which Jeff doesn’t want to wear, purely out of vanity. He doesn’t look cool in them and the whole point of taking Billiards was to look cool. He butts heads with his instructor on the subject until Jeff, in the mandatory shorts, challenges the instructor to a game of pool. The two also competitively lose a layer of clothing every so often until both are completely naked and Jeff eventually makes the winning shot, to which his instructor concedes that he can wear whatever he likes in the gym, but Jeff responds that he’ll wear the shorts. The stories are adorably tied together at the end when a classmate asks Jeff to introduce her to Abed and Jeff says she should probably introduce herself and we see her and Abed meeting each other. We never see her again, but it’s the thought that counts. Bonus: the tag features Troy and Abed acting as Ernie and Bert, respectively, before Troy has to rush off to his cousin’s funeral. I’m looking forward to seeing what Yahoo will do with the show now that they’ve picked it up for another season: SIX SEASONS AND A MOVIE! This entry was posted in tv and tagged A Fistful of Paintballs, abed, Advanced Dungeons and Dragons, annie, britta, chang, community, Conventions of Space and Time, Cooperative Calligraphy, Critical Film Studies, debate, Digital Estate Planning, Geothermal Escapism, jeff, Physical Education, pierce, pilot, Regional Holiday Music, shirley, Studies in Modern Movement, the dean, troy, Virtual Systems Analysis. Bookmark the permalink.